p. 100). During milling and construction, I refer to the drawings and the cut lists constantly. To do otherwise with so many parts to keep track of would inftoduce errors and would risk endless confusion. QUICK DRAW IX OS AND CUTLISTS save time and countless mistakes. Drawings and cut lists are used to double-check every stage of the construction process. Easy-to-read drawings show everything unique to the project (top photo on p. 99). Cut lists tell the dimensions of every piece even before the first board is milled. pane] thicknesses. I keep these details in my head so I don't clutter my shop drawings with them. Only what's unique to the piece gets put in the drawings. 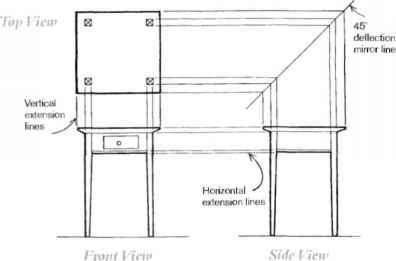 1 always draw an isometric view ofthe front and one side, an elevation ofthe back, and a top view. Often I'll add views of selected internal frames,just to make sure I keep them straight. I like to keep all drawings on a single sheet attached to a clipboard so that they're easy to check while I work. Once I have a shop drawing, I can calculate the dimensions of each piece. I then make two cut lists. One is organized around each section ofthe case (sides, back, internal frames).This list tells me what goes where and what joints to cut on which pieces. 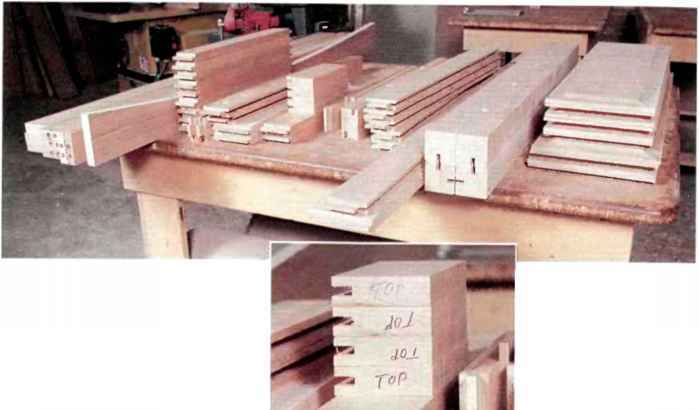 The other list is organized around the dimensions ofthe pieces—their length, width, and thickness before any tenons, dadoes, grooves, or moldings are cut. I list these pieces in descending order by size. Each list is valuable at different parts of the milling and construction process. When dimensioning stock, I have the second list close at hand because I don't need to know where the pieces go,just how many pieces 1 need of any one width and length,Then when I cut thejoints, I move to the first list. It tells me which part needs a tenon and which needs a mortise.When I've finished the drawings and both lists, 1 recalculate every dimension to catch omissions or errors. By investing two or three hours in the planning stages of each project, I have saved myself a lot of time and trouble over the years. IT ONLY t a k e s A FEW machine setups to cut all the dado-and-tenon joints in a case. A single dado creates both mortises and panel slots. After tenon shoulders are cut on the tablesaw, a double blade is used to cut both cheeks in a single pass. NEAT PILES KEEP EVERYTHING in check. With all the parts In an organized pile, Its easy to spot a mistake at a glance. Write the purpose, location, and orientation on each part, somewhere that won't show and won't be sanded off. The larger the project, the greater the potential for small errors to accumulate into big problems. A Yo in. offhere and a Yl, in. oft there can result in the case not fitting together during final assembly. Consequently, you need to be very accurate with dimensions, squareness, and Harness. To reduce the chance for confusion, I make all frame stock X in. thick and all panels Yi in. thick.The only exceptions are the corner posts, which are 2 sq. in. Fewer dimensions give fewer opportunities for error. I dimension ah stock at once.The advantage of this approach is that 1 don't have to recreate exact machine settings to cut matching stock at a later time. Starting from the second cut list. ] find the total linear footage of each width, adding some for waste and test pieces. While I'm dimensioning stock (and cutting j oinery), ] keep similar parts in neat stacks (see the photos above). Organized this way, they serve as a visual checklist. If] see one that is odd, I can make sure that there is a good reason.With this system, I have caught many errors while there was still time to fix them easily. When each piece is dimensioned, I label it according to its purpose and location in the finished case. Iflhe orientation oflhe piece is important, I note it as well.This helps tremendously during glue-up when I'm in a hurry and don't want to spend the time figuring out whedier I have the right piece in hand. Perhaps the most time-consuming part of large-case construction is the j oinery. W h e n each joint needs unique fitting, the work quickly becomes overwhelming. I solve this problem by limiting thejoints I use to two very simple types and cutting each type all at once. 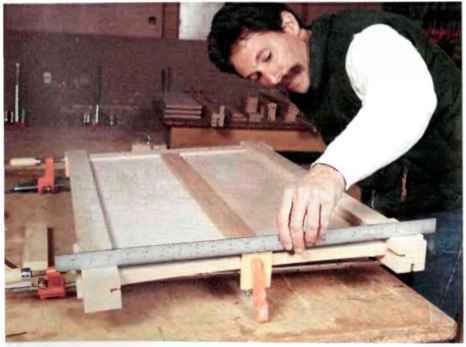 | use eidier a dado-and-tenonjoint or dowels. My doweling technique is conventional, but the da do-an d-1 e non j oint I use is a considerable tune-saver. IT'S FAR EASIER to assemble a large carcase In sections. Dry-fitting every part of a case ensures that glue-up won't present any surprises. both. I glue the tenons into the dadoes during assembly, but 1 leave the panels dry. A single dado cut on the edge of a board takes only a few seconds, yielding two morrises and a panel slot. Chopping deep mortises to receive tenons and then plowing dadoes to receive panels would take considerably longer. Because the dadoes are perfectly even in width, fitting the joints is only a matter ofmaking sure the tenons are the right width. For a strong glue joint between the dado and tenon, the parts should go together with moderate hand pressure but be reasonably difficult to pull apart. If you dry-fit two pieces together and pick up one, the joint should stay tight. I use the dado-and-tenon joint for almost all the framework in the case. The oidy exception is where the stretchers meet the front posts:There 1 use a /f-in.-wide and X-in.-deep dado with dowels. I use a shaper to cut the dadoes, though a router or a tablesaw with a dado blade could do the workjust as well. with a miter gauge, using the fence to determine the width of the cut. I leave the blade low so that it doesn't cut into the cheek of die tenon and make it weak. 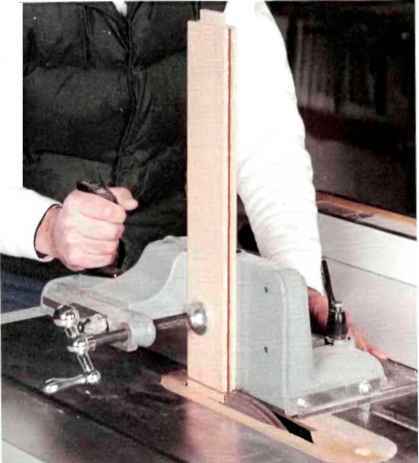 To cut the cheeks, I use a cast-iron Delta® tenoningjig and a double-blade setup in the tablesaw (see the bottom photo on p. 100). However, I don't use the K-in. Delta spacer between the blades because it's exactly X in. thick.To cut a X-in. tenon with double blades requires a thicker spacer to compensate for tooth set. 1 had a machine shop make a custom spacer to cut tenons that match the X-in. dadoes perfectly (two-thousandths of an inch will affect the fit from too tight to too loose).This setup still needs to be shimmed for die exact fit, the same way you shim a dado gang. But with this setup, I can produce tight, reliable joints throughout the piece. 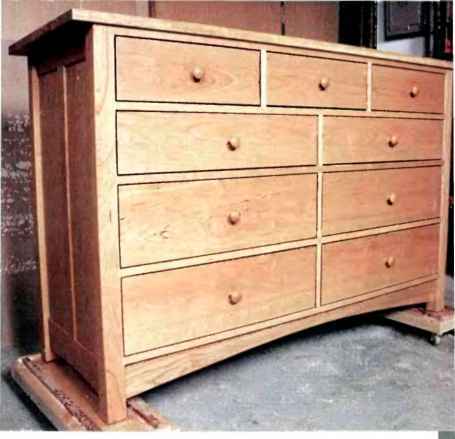 It is not possible to assemble a nine-drawer dresser in one fell swoop. It can also be very difficult to assemble one piece by piece. My solution is to divide the case into a number of smaller frames, which 1 assemble first (see the photo at left).The frames include the two sides, the back, and six internal frames. All sections are flat and easy to assemble. Afterward, assembling the frames into the complete case is just as easy. I always dry-fit each section to check the fit. I take this opportunity to make witness marks to indicate where parts go together. When 1 glue the parts together, the lines will guide me. Ifthe dry-fit is clean, I take the subsection apart and assemble it again with glue. I use prepared hide glue for several reasons. 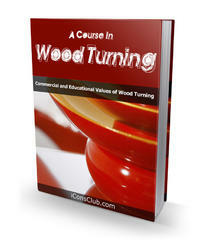 1 like it for its long open time, making one-man glue-ups simply hurried and not panicked. Also, the parts are easy to disassemble when repairs are needed in the future. CASE SIDES ARE CLAMPED up one at a time, double-checked for square, and set aside until final assembly. I've found that a small jig makes glue application less hectic. I drill a few %>-in. holes into a scrap of wood. I fill most of the holes with the glue I'll need for the assembly and leave a few oflhem dry to hold the glue brush when I'm not using it. This way, 1 don't have to squeeze glue out of the bottle each time I need a little more. After I clamp up the frames, I check three things. First I check the diagonals. Then I check the flatliess of the frames. If the diagonals are not within X<; in., adjust the clamps until they are. If the frames are not within this tolerance, final assembly will be far more difficidt and may result in a parallelogram -shaped dresser. I find that the climactic final assembly ofa large case is the most satisfying moment. It's when all the parts come together and start to look like somediing. But it's not the moment to rush.The time taken to dry-fit the assembled frames is always well spent. Iflhe case is twisted, you'll know before drying glue has you under the gun. I use undersized dowels for the dry-fit, so I can get them back out for glue-up with full-sized dowels. The key to a civilized glue-up ofa large case is having everything ready and at hand. I place all the clamps I'll need within reach and get the glue read); I make sure that I have a mallet to persuade unwilling parts. Work I have put into the parts previously will come to fruition. Ifall ofthe frames are square, the case will be square.You do need to check the diagonals across the face. But don't chase your tail checking the squareness of each opening. There's no way to adjust them at this point. Ifall ofthe parts are labeled, it wdl be easy to figure out where they go. And ifyou use hide glue, you can take your time during glue-up to get it right. The combination oflhese sttategies will make it possible to move through the budding process at a calmer pace and still finish a large case in less time. INTERNAL FRAMES ARE SET in the case sides one by one so final assembly doesn't become a frantic affair. Well-labeled parts, slow-setting hide glue, and having tools nearby will help the process go smoothly. 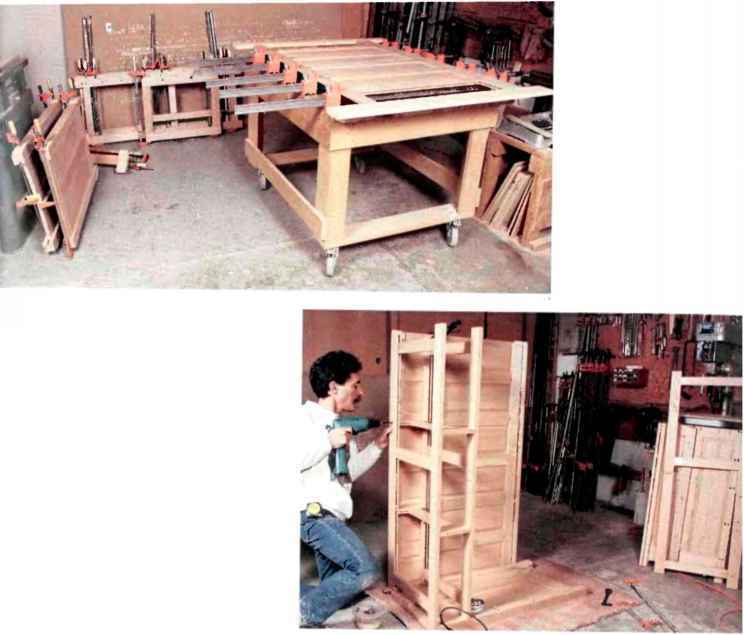 BRUCE COHEN builds custom furniture in Boulder. Colo.